Building work is beginning on London's £496m Olympic stadium, three months ahead of schedule. 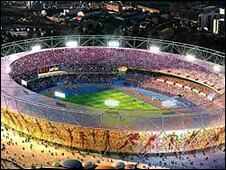 The 80,000-seat stadium in Stratford, east London, will host the opening and closing ceremonies of the 2012 games, as well as athletics events. Once the Olympics are over it will become a 25,000-seat community venue. The construction work coincides with the end of a three-day visit by the International Olympic Committee's (IOC) monitoring team. The building operation was due to start in August but work to clear the site in Lea Valley progressed more quickly than expected. The Olympic Delivery Authority (ODA) said 800,000 tonnes of contaminated soil had been removed since clearing began in July 2007. The first phase of construction will see 4,000 concrete columns inserted into the soil to form the permanent foundations for the stadium structure. Building firm Sir Robert McAlpine will then install floor slabs, lower tier structures and columns to support the pedestrian concourse level. Early next year, the erection of steel structures to support the stadium roof will start. The stadium is due for completion in 2011. After the games the stadium could also become home to a lower league football or rugby club. During its visit, the IOC asked London 2012 organisers for assurances over the progress of its athletes' village. Only one firm, Australian constructor Lend Lease, has bid to build the village and the ODA admitted the "challenging" global economic climate made agreeing a final contract more difficult. However, it insisted work on the village would start next month.